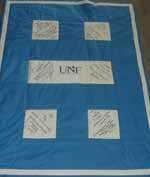 This is a signature quilt I made for my MIL's 80th birthday. There are 25 signature blocks, and 36 pictures of children, grandchildren (that's my "baby"...just turned sweet sixteen in the 3rd row with the pigtails, and my little boy - now 19 in the same row, second from th right), other family members, and friends. 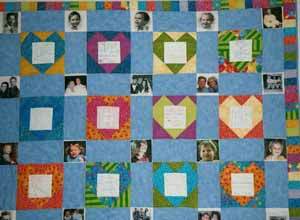 The sashing pieces between the pictures were quilted with names and pertinent dates. 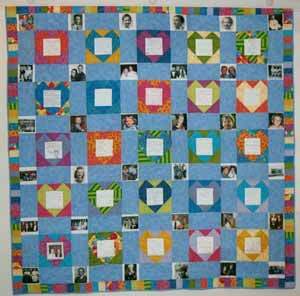 Other blocks have a double heart quilted.